The Senate confirmation battle over Brett Kavanaugh was the most vicious Supreme Court fight since Clarence Thomas narrowly won confirmation in 1991. The victors will reap the spoils of success and the losers will lick their wounds and brace for the inevitable fallout a month ahead of the midterm elections. McConnell has long had an up-and-down relationship with conservative activists, who have criticized him through the years for cutting deals with Democrats. But they have to acknowledge the GOP leader has had a major impact on the court. McConnell often prefers to stay out of the spotlight and played more of a behind-the-scenes role in last year's effort to repeal and replace ObamaCare and reform the tax code. But McConnell spearheaded the defense of Kavanaugh and never wavered in his support, quashing any chatter in the GOP conference about having the embattled nominee withdraw after Christine Blasey Ford accused him of sexual assault at a high school party. Even McConnell's conservative critics hailed his defense of Kavanaugh, which kept the Senate GOP conference unified. It's an impressive encore for the leader, who was fiercely by Democrats for keeping the seat of late Justice Antonin Scalia vacant for nearly a year and blocking President Obama's nominee, D.C. Circuit Court Chief Judge Merrick Garland. "It's big and obviously this ended up being a lot harder than the Gorsuch nomination," McConnell in an interview Saturday. "It's extremely significant, not only for the Senate Republican majority and the president, but for the country." Had Kavanaugh failed, McConnell likely would have received a public tongue lashing from Trump, who chewed him out in a private phone call for what the president saw as letting the confirmation process get away from him. A high-profile failure on the Supreme Court and fallout from Trump would have given ammo to a conservative primary challenger in Kentucky's 2020 Senate race. Instead, the confirmation of Kavanaugh following last year's confirmation of Justice Neil Gorsuch will shape the Supreme Court for years to come and give McConnell a major accomplishment to tout. Months before Justice Anthony Kennedy announced his retirement in June, Senate Republicans said they hoped he would step down and set up a battle over the Supreme Court just before the election. They got their wish and the partisan battle over Kavanaugh unified their base beyond expectations after the sexual assault allegations that were leveled at the nominee late in the process. McConnell in an interview Saturday called the successful confirmation vote: "a shot in the arm for us going into the fall election." Republican polls show that voters in deep-red states where vulnerable Democrats are running for re-election strongly favored Kavanaugh's confirmation. McConnell told The Hill that his political advisers say there are already signs the battle over Kavanaugh has revved up the GOP base in red states beyond expectations. "I talked to a couple of my political advisers yesterday and this has been a shot in the arm for us going into the fall election because it underscores the importance of the Senate and our role in personnel and of course the most important personnel decisions we make are the courts, and particular the Supreme Court," McConnell said in an interview Saturday. "Our base is on fire," he said. The politics cuts the other way in the fight over the House majority because Republicans must defend 25 seats in districts won by Hillary Clinton in 2016, many in states where voters favor abortion rights. GOP strategists expect the Supreme Court fight will rev up conservative voters in red-state Senate battlegrounds but they expect it will do the same for Democratic voters in pro-Clinton House districts. A Democratic poll released Wednesday found that women in four GOP-held districts in or near Orange County in California said they would be much less likely to vote Republican if Kavanaugh was confirmed. The survey was conducted by Change Research for Fight Back California and the California Labor Federation. A national GOP strategist told The Hill earlier this week that Kavanaugh is "probably a drag on suburban Republicans who need to thread a very tight needle in order to hang on in this environment." Republicans say that Trump's expected impact on the court is what helped unify their party behind him in the 2016 election and helped convince many evangelical voters to back him even after the release of the infamous "Access Hollywood" tape. Trump promised to appoint "pro-life" judges to the court during the campaign and can now point to two new additions who will shape the ideology of the high court for years to come, though it remains to be seen how they will rule on the landmark abortion rights case, Roe v. Wade. Trump has been hungry for a big accomplishment in 2018 after getting Gorsuch confirmed to the Supreme Court last year and a $1.5 trillion tax cut passed in December. If Democrats capture the House, as is expected, Trump will find it much harder to get legislative accomplishments passed through Congress. The fight over Kavanaugh helped unify the party behind him like no other issue, Republicans say. "This is the first time the country club Republican and the Trump Republican has come together," Sen. Lindsey Graham (R-S.C.) told The Hill earlier this week. Kavanaugh's confirmation has mobilized young single women, a key constituency for Democrats, like no other issue this election cycle and that's bad news for Democrats. The Cook Political Report in recent days has moved a slew of House races in the Democrats' direction. The Kavanaugh fight drew comparisons to the bitter confirmation fight over Supreme Court Justice Clarence Thomas, whom Anita Hill accused of years of sexual harassment in gripping Senate testimony. The public backlash in the wake of the Thomas-Hill hearings helped make 1992, when Democrats won the White House, the Year of the Woman. Many of the most contested House districts are in suburban areas where an increased turnout of women voters voting Democratic would make a significant difference. The Kavanaugh debate has put the law enforcement agency again at the center of a political maelstrom. A poll by NPR, PBS NewsHour and Marist University earlier this year showed a growing number of Americans are beginning to view the agency as biased. The survey found that 3 in 10 Americans saw the FBI as biased against Trump. Now it is under fire from Democrats. Democrats this week loudly criticized the FBI's supplemental investigation into Kavanaugh's background as too narrow and ultimately ineffective. Trump told reporters last month that he didn't want to involve the FBI in probing Ford's allegations because the agency didn't want to be involved in another political controversy after finding itself the target of criticism in the 2016 election and more recently because of Special Counsel Robert Mueller's investigation possible Russian collusion with the Trump campaign. The vote on Kavanaugh will inflict political damage on both sides of the aisle. Republican Sen. Susan Collins (R-Maine) will see a well-financed Democratic challenger in 2020 should she seek re-election. Collins's vote for Kavanaugh inflamed Democrats and independents in Maine where 50 percent of voters said they would be less likely to vote for as a result, according to a recent survey by Change Research, a firm with Democratic ties. Sen. Lisa Murkowski (R-Alaska) is not up for re-election until 2020 but she could face fallout from conservatives in a Republican Party as a result of her opposition to Kavanaugh. Former Alaska Gov. and vice presidential nominee Sarah Palin taunted Murkowski in a recent tweet, writing "Hey @LisaMurkowski - I can see 2022 from my house..." a reference a statement she made about being able to see Russia across the Bering Strait form Alaska. Senate Democrats running for re-election in red states that Trump carried by double digits are already coming under attack for opposing Kavanaugh. Polling by Public Opinion Strategies, a GOP survey firm, found 56 percent of voters in North Dakota and 58 percent of voters in West Virginia favored confirming Kavanaugh. The National Republican Senatorial Committee began cancelling ad time in North Dakota after Sen. Heidi Heitkamp (D-N.D.) announced her opposition to Kavanaugh, a sign that they see the race as a likely Republican win. Indiana Sen. Joe Donnelly (D) has come under harsh attack from his opponent, businessman Mike Braun, for stating last week his plan to vote no. Sen. Joe Manchin (D-W.Va.) is the only centrist likely to escape immediate political harm. Republican strategists acknowledge that he helped himself by being the only Democrat to vote for Kavanaugh. That will help him bolster his claim that he's an independent willing to work with Trump in a state that Trump carried by 42 points in 2016. But he was criticized by Trump's son Don Jr. for waiting until Kavanaugh had enough votes to be confirmed. Spotlight-seeking lawyer Michael Avenatti was criticized both Republicans and Democrats for championing the claims of Julie Swetnick who says she saw Kavanaugh attend parties where girls were grabbed without their consent and where "gang rapes" occurred. The claims were so extreme they prompted skepticism even among Senate Democrats, who were hesitant to press them even while they championed Ford's allegations. Kavanaugh dismissed the allegation as a "joke" and a "farce" during his testimony before the Senate Judiciary Committee and Democrats on the panel declined to pursue them. An interview with NBC's Kate Snow raised questions about apparent inconsistencies in Swetnick's story and attempts by the media to reach people who could corroborate her claims came up short. When Avenatti, a lawyer who is best known for representing Stormy Daniels, the adult film actress who said she had a sexual affair with Trump, jumped into the Supreme Court debate, Republican senators predicted it would help their cause. They said the entry of such a polarizing player would help rally their base behind Kavanaugh and that's what happened. A senior Democratic aide said Avenatti was counterproductive to their efforts to stop Kavanaugh and defend Ford's credibility. "He f***ed it all up," the aide said. Saturday's final confirmation vote capped one of the most rancorous political fights in Washington of the past decade and it was interrupted several times by screaming protesters, mostly women, who vented their rage over the process. Kavanaugh blasted the Senate's process as a "national disgrace" when he testified before the Judiciary Committee, and accused senators of twisting their constitutional duty of "advice and consent" into search and destroy. He emerges tarnished from the vicious fight and lamented before the committee that his name had been permanently destroyed. Supreme Court Justices Elena Kagan and Sonia Sotomayor warned at a conference hosted at Princeton University Friday that the nation's political polarization threatened the Supreme Court's reputation as a neutral arbiter. 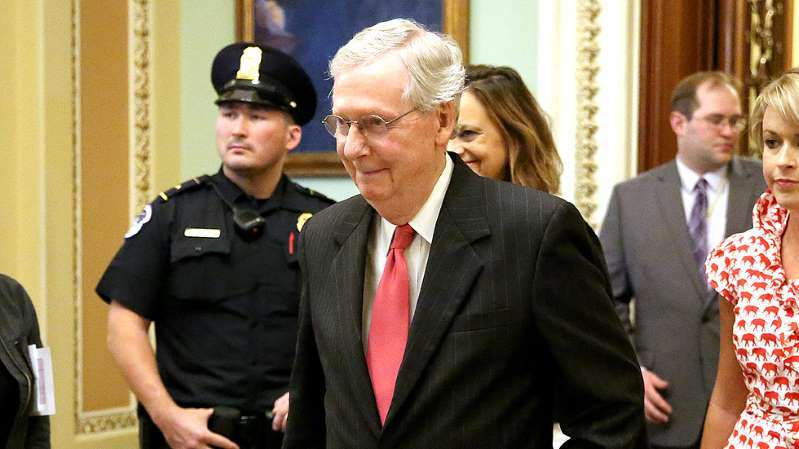 Republican senators in recent days have said the Senate confirmation process has hit "rock bottom" and McConnell has excoriated Democrats of orchestrating a "shameful smear campaign." McConnell on Saturday accused liberal activists who confronted Republican senators in the hallways of the Senate office buildings and at their homes of trying to "intimidate" them into opposing the nominee. Senate Democratic Leader Charles Schumer (N.Y.) on Saturday called the bitter fight "one of the saddest moments in the history of the Senate." "The Republican Majority has conducted one of the least transparent, least fair, most biased processes in Senate history, slanting the table from the very beginning to produce their desired result," he said on the Senate floor.